Traits of Seth people: Perfection, Impulsive. Lucky Colors: Turquoise for men, Black for women. Associated Zodiac Sign: Gemini ♊. Seth is the god of war, destruction, storms, darkness and chaos. At the same time, it was considered a symbol of freedom. He was jealous of the glory of his brother Osiris, he killed him. 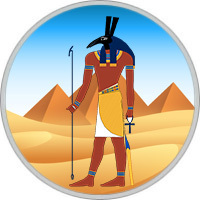 However, Isis, the wife of Osiris, with the help of wise Thoth and Anubis, the god of the dead, managed to revive her husband. In punishment Seth was sent to heaven, where we can see him and still in the form of a constellation Ursa Major. The Egyptians portrayed Seth as a man with the head of a wild boar and attached special importance to his cult. The children of Seth always aspire to leadership and the seizure of power, they are ambitious, self-confident and righteous. In politics, they feel like fish in water and often make their way to the highest echelon of power. Seth is the patron of divination, as well as the dark occult sciences. His wards have the gift to predict destiny, using any signs: maps, coffee grounds, even clouds. Their predictions are always accurate, and the conclusions are correct. These people believe that barriers are created in order to overcome them. They see a challenge in everything, they are always ready to fight. By nature, they are conquerors and invaders. They always rely only on themselves, do not trust their friends, tend to compete with them even in small things. Do not recognize any restrictions, rather selfish. If they feel that they can not win, they temporarily retreat and save power. In love, they want to own their partner unchallenged, exclusively and morbidly jealous. They tend to suppress a partner, and at the same time, they are simply not interested in weak people. It is not easy for them to create a harmonious union, this requires a completely exceptional person, possibly also born in this period. The perfect opposite will also suit: a frivolous, cheerful and open partner who so easily relates to life that all of Seth’s gloomy insinuations roll off him like a gusher’s water. Seth man is a conqueror by nature and used to achieve his goals. It is better not to contact him, you will lose anyway. Seth does not like to look back, always goes only forward, not paying attention to difficulties. Such people do not learn from their mistakes, so they have to start from scratch each time their hard way. It is very difficult for a man to find inner balance, so he has to struggle with his own contradictions and does not always manage to get the coveted victory. The Seth woman used to rely only on herself, she is free-loving, impulsive and jealous. With such individuals it is very difficult to find a common language, it dissolves completely in your personal life and requires the partner to give in. Emotions always take precedence over her, at the subconscious level she strives to find a man who will withstand such pressure psychologically. It is necessary to struggle with selfishness and learn to trust people, then it will be possible to hope for changes for the better.